The stories behind some of New Canaan, Connecticut’s treasure trove of modernist homes have been less than uplifting. 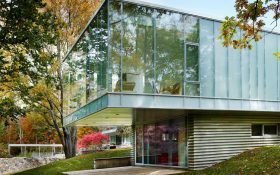 In addition to Philip Johnson’s famous Glass House, the wealthy enclave boasts dozens of homes by Johnson and his colleagues known as the Harvard Five. An ongoing battle simmers between some of the town’s wealthy residents who favor sprawling McMansions and a passionate contingent of modern architecture fans. At least 20 of the homes, built in the 1940s, ’50s and ’60s–have been torn down, usually to build larger houses on the property. One embattled example is a lesser-known Johnson house known as the Alice Ball House. 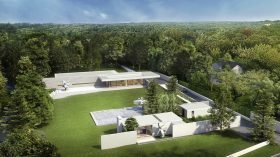 The 1,700-square-foot home, built in 1953, has been referred to as a “livable version of the Glass House.” And it’s now for sale for $7.7 million–along with approved plans by the current owner, an architect who has envisioned a companion property on a much grander scale, including an indoor pool and a massive skylit underground garage. Marcel Breuer isn’t just the architect behind the original Whitney Museum of Art–he’s also known for his mid-century modern home designs. 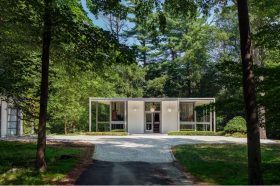 And now there’s an incredible chance to buy the New Canaan, Connecticut home he actually designed for himself in 1951. The striking home has changed hands several times after Breuer’s death, according to DesignBoom. But the current owner commissioned New York-based architect Toshiko Mori to extend the property. A steel and glass extension gives the property a modern edge, which also doubling its size to four bedrooms over 5,577 square feet. It’s asking $4.35 million. New Canaan, Connecticut became the hot-spot of modern architecture in the 1940s and 1950s, when a group of architects known as the Harvard Five settled here and built nearly 100 modern homes. Of the surviving properties–20 were torn down over the years–this one still stands in impressive condition and is now on the market. The DeSilver House is a striking midcentury modern design by architects Harrison DeSilver and John Black Lee. From the exterior, floor-to-ceiling windows frame views of the nearly three-acre site, and the interior is chock full of preserved modern details. It’s been offered through a private sale by the owner for $1.7 million. 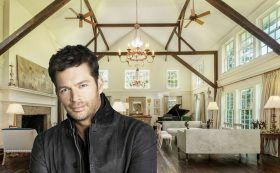 Singer and actor Harry Connick Jr. and his wife, former Victoria’s Secret model Jill Goodacre, bought this 4.6-acre Connecticut estate, a former dairy farm, in 1998 for $1.54 million. After a two-year renovation and nearly 20 years raising their three daughters here, the couple has decided to part ways with the rustic New Canaan home, listing it for $7.5 million, according to the Wall Street Journal. The seven-bedroom main house, once a barn built in the 1890s, is joined by a heating pool and pool house, another former barn that serves as a gym and storage, and a third smaller barn where Connick writes music. 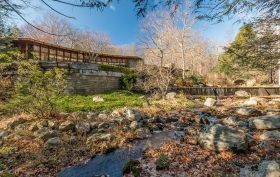 For the first time in 20 years, Frank Lloyd Wright‘s “Tirranna” home in New Canaan, Connecticut is on the market. The Wall Street Journal reports that the home, which Wright built just before his death in 1959 on a 15-acre wooded estate, has been listed for $8 million by the estate of its long-time owner, the late memorabilia mogul and philanthropist Ted Stanley and his wife Vada. Though the couple renovated the horse-shaped home, they maintained its original architectural integrity, preserving classic Wright details like built-in bookshelves, cabinets and furniture, as well as other unique features such as a rooftop observatory with telescope, gold leaf chimneys, and sculpture paths that wind through the woods.